Enjoy tomatoes year-round by processing them into sauce. Whether you grow, acquire or purchase tomatoes, making homemade sauce allows you to create satisfying meals including pasta, pizza and casseroles. Homemade sauce has a fresher taste than commercial sauce and does not require preservatives. You can customize ingredients to suit your own taste and adjust the size of your batches to make one meal or stock your pantry for the year. Process 20 tomatoes to yield 7 pints of sauce. Cut a small "X" on the bottom of each tomato with a paring knife. This makes the tomatoes easier to peel. Place the tomatoes in the boiling water, working in batches. Keep the tomatoes submerged for 30 seconds, then immediately plunge them into a large bowl of ice water. Set the tomatoes aside on a platter while you blanch the remaining batches. Peel the skins off the tomatoes by pulling the flaps created by the "X." Cut the tomatoes in half with the paring knife and scrape out the seeds. Discard any juice that drips off as you scrape the seeds. Place batches of tomatoes in a colander and gently shake to remove excess juices and water. Transfer the tomatoes from the colander to a large pot until all the tomatoes are in the pot. Add seasoning to the pot based on your preferences. You may use a commercial tomato sauce seasoning mix or customize your own ingredients. The "Ball Blue Book Guide to Preserving" recommends the following seasonings: chopped onions and minced garlic sauteed in olive oil, oregano, black pepper, sugar, salt and crushed red pepper. Add bottled lemon juice if you are canning your sauce. Heat the ingredients, stirring frequently with a wooden spoon until the sauce reaches a boil. Serve immediately or preserve the sauce by ladling it into pint jars and processing in boiling water or a pressure canner. You may also ladle the cooled sauce into freezer-safe storage bags for future use. 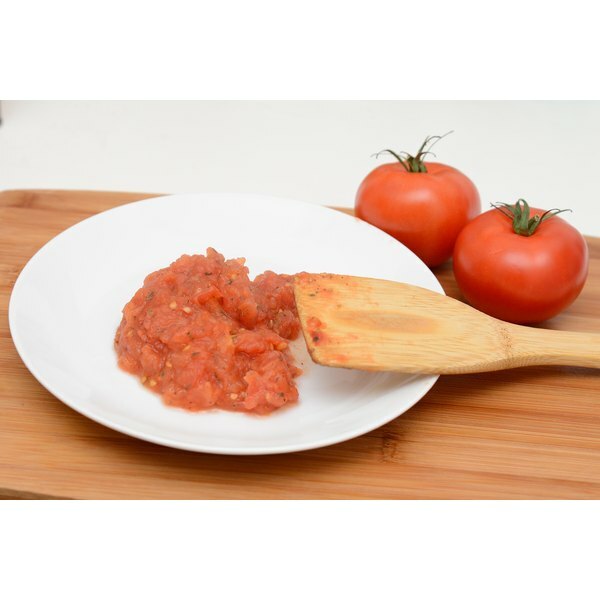 Add a can of tomato paste to your sauce if it needs thickening. Roma and plum tomatoes are ideal for sauce since they form a thick texture when mashed and have robust flavors. For a smoother variation, puree the sauce in a food processor after it has reached a boil and simmer for 20 minutes. Then, strain it through cheesecloth back into the pot and bring it to a boil again. PickYourOwn.org estimates the cost per jar of homemade tomato sauce at about 65 cents, based on a recipe that yields seven pints. This price includes canning jars. Based on this information, homemade sauce provides significant savings compared to commercial sauces, which range in price between $2 and $5 per jar. If you add meat to your sauce and intend to can it, pressure canning is the only safe method.